A classically trained chef, Matthew Kenney made a splash in the food world when he ditched animal products and his oven, and went the raw, vegan route. Now Matthew’s thriving plant-based food lifestyle business spans the globe—from restaurants, to a culinary school, gourmet products and much more. 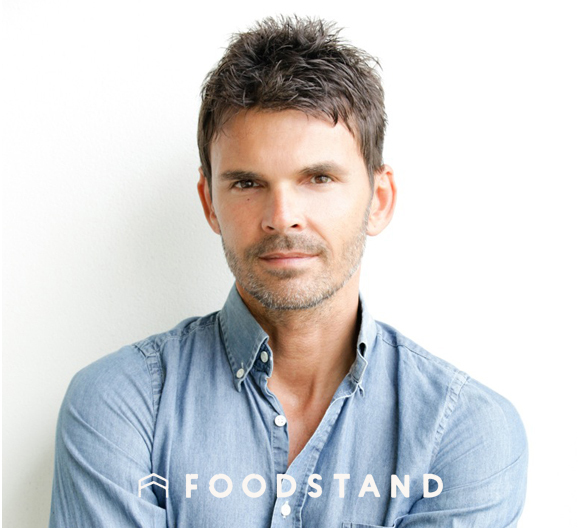 And lucky for us, he’s offering Foodstanders 10% off all courses at his academy, Matthew Kenney Culinary! We operate in 5 business sections—hospitality, education, products, services, and media. This allows us to cast a wide net and reach all of those interested in plant-based cuisine, whether it’s dining in one of our restaurants, attending a class, or reading a book. What has been your biggest challenge with relation to your business? I was a traditional chef for many years. When I left cooking traditional protein I knew this was the right decision for me personally and professionally, although many of my peers didn’t understand how I could make this transition. It has taken some time for the community to recognize how integral and innovative plant-based cuisine can be, but we continue to see progress in this movement everyday. I’m honored to be part of this work. Food issues have not quite made it into the Presidential campaigns. If you could ask the future President to consider a food issue that needs to be addressed, what would it be? There is a lot of talk about healthcare. I believe it’s integral that we recognize overall health and wellness is directly related to our what we put in our bodies. Consuming even slightly more of a plant-based diet will have an enormous impact. We strive to bridge the gap between culinary art and nutrition. In addition to being beautiful and good for you, we prioritize innovation, local and seasonal ingredients, and education. Education is the foundation of everything we do. Our work in education is the most rewarding part. Teaching young chefs from around the world and watching them apply the techniques and principles learned in our program is incredibly inspiring. We learn from our students just as they learn from us. Are there any personal beliefs that you have with regard to the overall food system that make their way into your everyday business (e.g., curbing food waste, sustainable sourcing, local sourcing)? Do tell. Yes, we have a culinary garden at our academy and restaurant in Venice CA, and at our academy in Thailand. We teach sustainable practices and the importance of urban agriculture, and we source organically whenever possible. We support local farmers and believe the very best seasonal ingredients create the absolute best dishes. Anything new around the corner for you? Yes, we just opened 00+Co, a plant based pizza concept, in New York, and are opening a restaurant and academy in Miami this month. I’m working on a new book and have a number of other projects in the works. It’s good to be busy. What can we see on the menu at 00+Co? Pizza and flatbreads have been part of our cuisine for many years, but this is the first time we have a dedicated concept around it. We will have a beautiful section of small plates, organic pizza prepared in a wood burning oven, vegan desserts, and a beautiful list of bio-dynamic wines. Opening a restaurant can be complex and stressful. What are some top tips for those interested in getting in the restaurant business? Surround yourself with a talented, dedicated team, and together it will happen. No one can open a restaurant on their own. How do you see social media and social discourse changing the food industry, our place in the industry, and people’s views? Social media’s influence is huge. We have photoshoots in the kitchen almost everyday to showcase what we’re working on. When people see how beautiful food can be, they want to eat well and try new things. Social media allows me to follow the work of our students around the world—scrolling through my feed and seeing their plates is my favorite part of the day. Eat one plant-based meal a day. All of my early memories involve food! I have memories foraging and picking berries with my family in Maine. Growing up in Maine really shaped my understanding and love for nature—it’s where I fell in love with food. I had planned to go law school at one time. If I didn’t end up being a chef I would have been a lawyer. I’m really inspired by Elon Musk’s work, so it would be interesting to sit with him. I’d love to have a meal with him at Plant Food and Wine in Venice, and discuss how his work in sustainability intersects what we do. My fridge is full of green fruits and veggies. I have a green juice every morning to fuel my day before I go to yoga. What was your biggest food fail? One of the first times I served raw cuisine to a group I spent a lot of time preparing our zucchini lasagna in sheet pans ahead of time. I had never served this at a large event before, and the extra moisture turned the lasagna to mush. I had to serve a group of my peers this horrible dish and was mortified. I never plated this in advance again! I wish that the access to good, healthy food was extended so that all communities could enjoy nutritious, plant-based cuisine.